Reliance Jio Infocommm Limited’s Jionet was available at the Rajiv Gandhi International Cricket Stadium, Uppal yesterday. It provided cricket fans with Wi-Fi during the 12th match of the VIVO IPL 2016. The company had set up high-speed Access Points (APs) at the stadium. 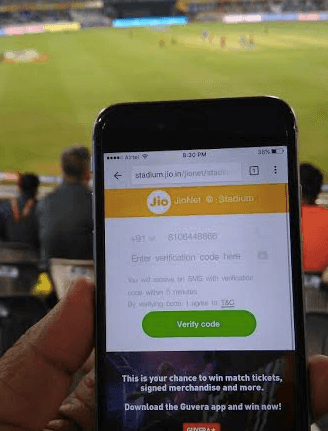 Initially, Jionet was made operational at Wankhede Stadium during India and South Africa One-Day series in April 2015. According to Reliance, the company witnessed a record data usage of over 22 TB of data get downloaded via its networks. 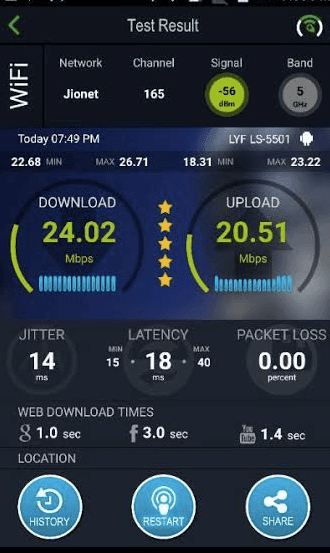 In order to access the network, the users had to switch on the Wi-Fi on their smartphones and connect to Jionet. A login page appeared, which asked for the user’s mobile number. The user received an OTP via SMS, which was inserted in the required space to get connected. The speed ranged between 20-30mbps. RJio is gearing up for the commercial launch of 4G services. It done a soft launch of the services for its employees. i am using Idea 4G karnataka SIM to access Idea 4G in Tamilnadu at the same time Idea 4G karnataka sim using tamilnadu aircel 2g network and no main balance deduced…. RCom 4G sims will be available from next week in Reliance stores its in the news. But only cdma customers will get to upgrade to 4G sim. No new cdma connections will get activations now. And no one will be able to use 4G until JIO doesnt launch it too. This is true news. And the rumour is that JIO will launch in the first week of May. RCom will launch on that very same day too only in those cities where Jio launches.